I love the story of puttanesca, a sauce as salacious in meaning, as it is pungent in flavour. Puttanesca literally translates ‘in the style of prostitutes," referring to its Neapolitan roots when prostitutes would engage the heady aromas of garlic, anchovies, capers, and olives tossed with pasta to lure customers to their doors. Whether this story is true or not, I am still always drawn to food with a juicy backstory. 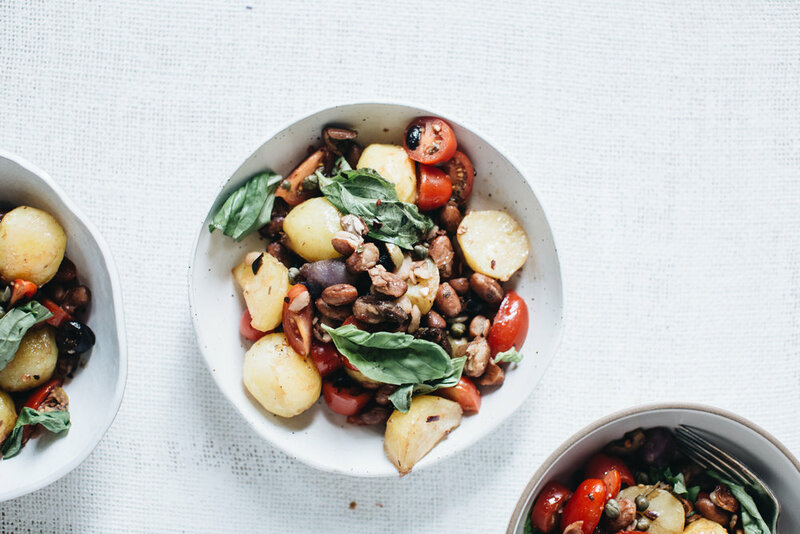 This salad is puttanesca reinvented – the punchy sauce, made with pantry staples of olives, capers and balsamic vinegar, is used to dress roasted potatoes. It’s deeply satisfying and beaming with flavour. If you want an even heartier dish, add a short pasta such as orecchiette or cavatelli to create a classic pasta and potato salad. This is a great salad for the holiday feasting table. To make the puttanesca sauce, place the tomatoes in a bowl, and add the olives, capers, red pepper flakes, balsamic vinegar in a small bowl and stir. Drizzle with a 2-3 tablespoons of extra virgin olive oil. Season with pinch of sea salt and black pepper and set aside. As it sits, the acid and salt will draw out moisture from the tomatoes, creating a saucy texture. Bring a medium pot of salted water to the boil. Add the potatoes and cook for 10 minutes, until they are par-boiled and slightly softened. Drain. Place the potatoes on a baking tray, cover in olive oil, season with sea salt and roast in a hot oven for 20-25 minutes, until golden and tender. Combine the potatoes with the puttanesca sauce and borlotti beans. Toss well to combine. Season with sea salt and black pepper. Top with herbs to finish and serve warm or at room temperature.